Former middleweight champion Gennady ‘GGG’ Golovkin 38-1-1 (34) has delivered a backhanded compliment to his conqueror Saul ‘Canelo’ Alvarez 50-1-2 (34) after the Mexican claimed the WBC and WBA 160-pound titles against the Kazakh bomber with an impressive 12-round majority decision win in their rematch at the T-Mobile Arena in Las Vegas, Nevada on Saturday night. “We can say a lot of things but first we have to congratulate Canelo,” said Golovkin in quotes published by Fightnews. “We can talk about a lot of things. I feel like I’m a champion and he is a champion. I felt really comfortable in there and feel that I did enough to win. The 28-year-old Alvarez had the better of the early going, backing Golovkin up and hammering him with hard shots to the body and head for much of the first eight rounds. But the reigning middleweight champion finished strongly, exploiting the suspect stamina of the younger boxer with power shots behind a ramrod jab. When the dust had settled Alvarez was declared the winner by scores of 115-113 or seven rounds to five by respected judges Dave Moretti and Steve Weisfeld, while third judge Glenn Feldman couldn’t split the pair with a card tally of 114-114. It was the first loss of Golovkin’s 12-year pro career. The 36-year-old Golovkin, who was attempting to break Bernard Hopkins’ record of 20 title defences in the alphabet era, wants a third crack at Alvarez after their first fight a year ago ended in a controversial draw. “As a fighter and boxer, I will continue to do my job to prove I’m the best. We would like to have a third fight. It would be great to fight him again. I will be back,” he said. 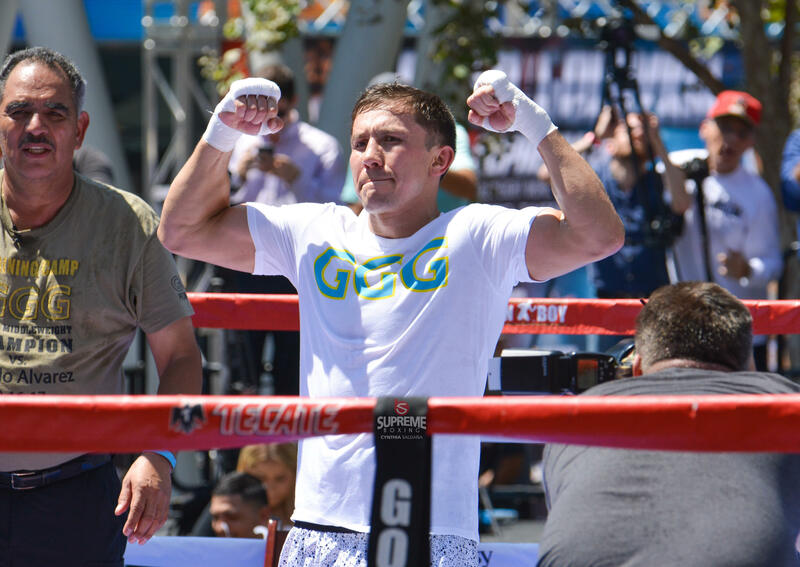 Golovkin’s trainer Abel Sanchez said: “We have to congratulate Canelo. Hopefully, we can do it again. I was expecting Canelo to fight. You can’t take nothing away from him. He is the champion today. Alvarez has stated he wants to return in December with Canadian knockout artist David Lemieux 40-4 (34) – who knocked out top 10 ranked contender Gary ‘Spike’ O’Sullivan 28-3 (20) in a single round on the undercard – believed to be the frontrunner. Golovkin promoter Tom Loeffler is already banging the drum for a rematch. “I think it was a tremendous fight. We on the Gennady side feel he won,” said Loeffler. “Canelo fought a tremendous fight. He deserves credit. He brought the fight to Gennady. We have to give both of these guys credit.